Birding Is Fun! : Is it Spring yet? It certainly doesn't feel like spring, as of the writing of this post it is currently 24° here. The weather has been up and down, one day in the 50s and the next in the 20s. However, birds don't take their cues to migrate from the weather. They rather rely on the increasing amount of daylight as their cue. 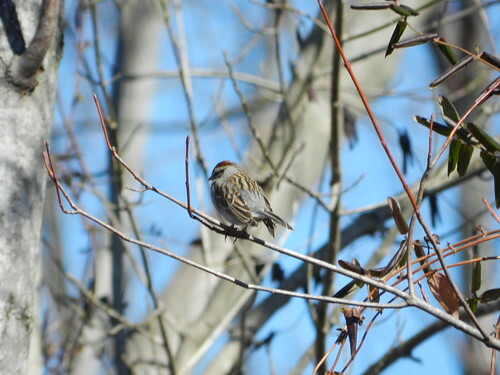 That being said, I was a little surprised to find a small flock of Chipping Sparrows in early February. 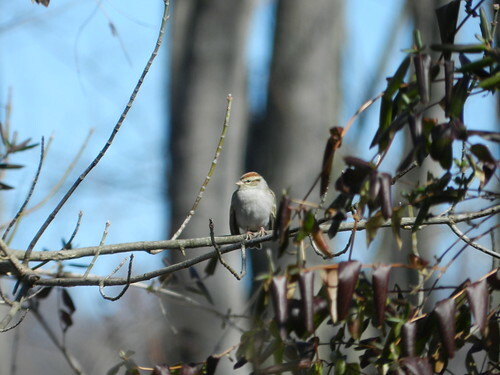 I don't typically see them until March, although as of late I have been seeing at least one bird on one of the two Christmas Bird Counts that I regularly participate in. 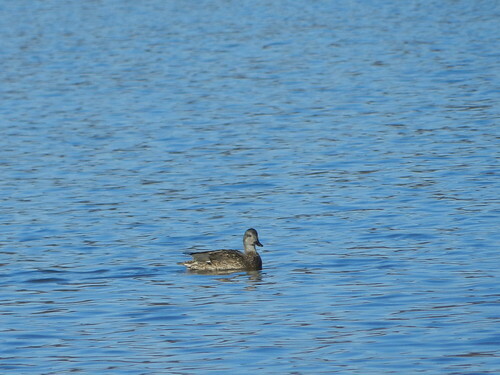 One of my favorite early spring birding opportunities is to watch courting waterfowl. It is about the only time when the males let their guards down and come in close to shore to show off to females. However, I guess the colder weather has them still holding off. 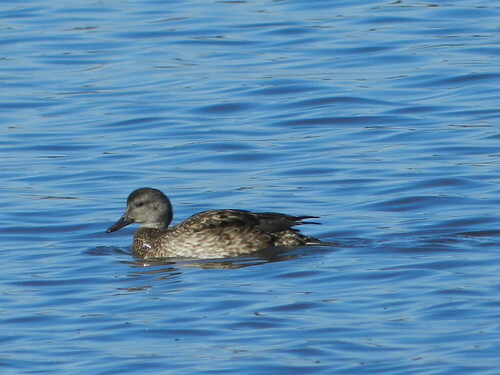 There have been some female Gadwall hanging out with some coots at East Fork for a while now. I kept wondering where all the males were. 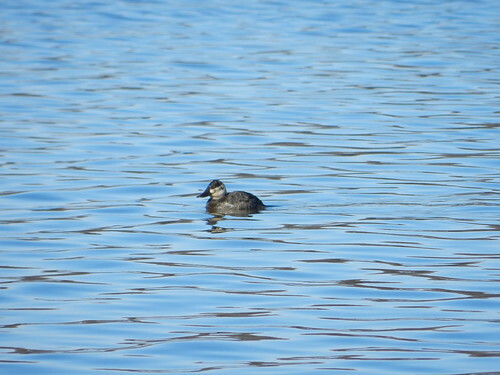 The females will approach somewhat close as long as the coots are content. I have found a group of males hanging together, however they were very far off. Here is one trying to get as far from me as it can. Such a nice looking duck. 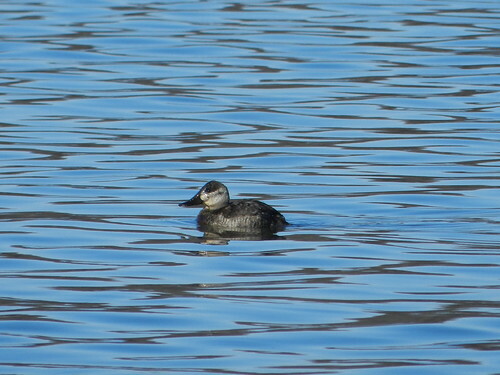 A female Ruddy Duck sneaked up on me while I was looking at the female Gadwall. It looks like the duck has a smile on its face. 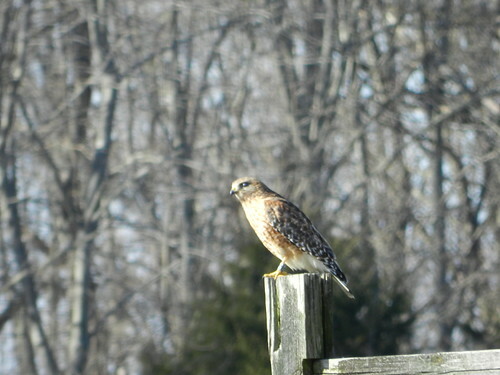 Later in the day, I came across this Red-shouldered Hawk. A nice looking adult. The afternoon lighting was harsh for photos, but I can see the bird's nictitating membrane. 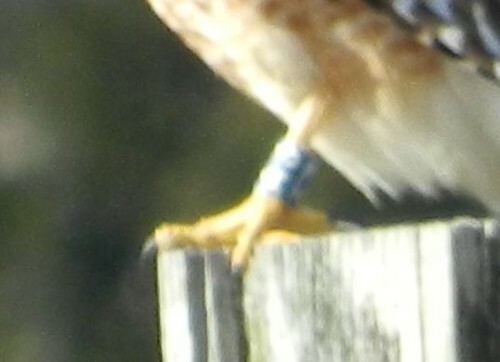 Only when I was looking at the picture on my camera, did I notice that the bird was banded. It was too far off and the lighting to blown out to be able to read the text/numbers on the band. This is pretty cool for me. I believe that this bird is from this project that has been going on for a while now in the Cincinnati area. The website here has some more information on Red-shoulders in the Cincinnati area - Red Shouldered Hawk Research in Southern Ohio. Hoping for some warmer weather! Woodcock should be doing their skydances soon! How nice to see the chipping sparrows. I always look forward to seeing them in March. 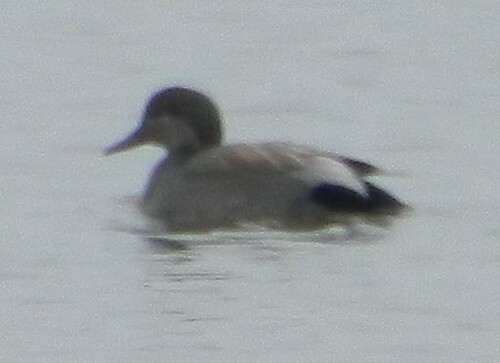 Pretty waterfowl featured in this post! ...I've been looking for them, Donald, but none yet. We have had Red-winged Blackbirds, though!